I hosted a Halloween Dinner Party a few years ago and thought I would create a fun tablescape for my guests. Having hosted several Halloween parties over the years, I had plenty of things to set the mood. 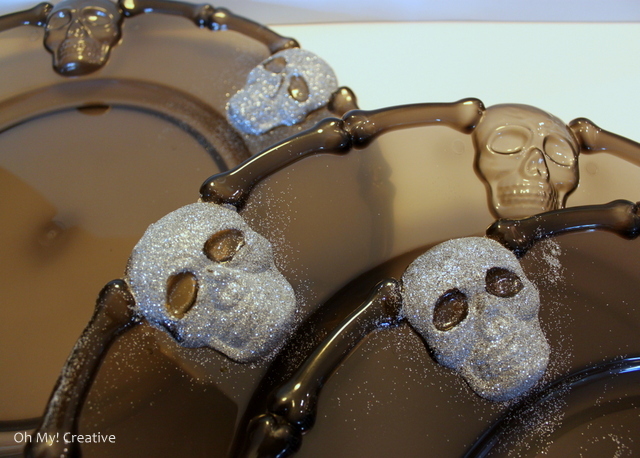 I had bought a few of these skull platters at Dollar Tree for a past party and saw that they still carried them this year. They are over-sized and meant to serve food on…the perfect size to be a dinner plate charger! 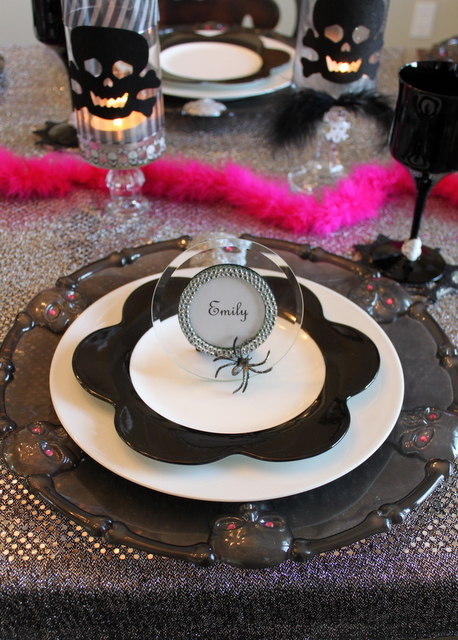 Hope you like my Glam Halloween Charger Plates From Dollar Store Platter! If you love Halloween like I do, don’t miss all my creative Halloween ideas here! If your not hosting a party this year, you will want to print out my Free Printable Ghostess with the Mostess Gift Tag for your hostess gift…so cute! Using a paint brush…paint the area you want to glitter with Mod Podge – I left the eye sockets clear. 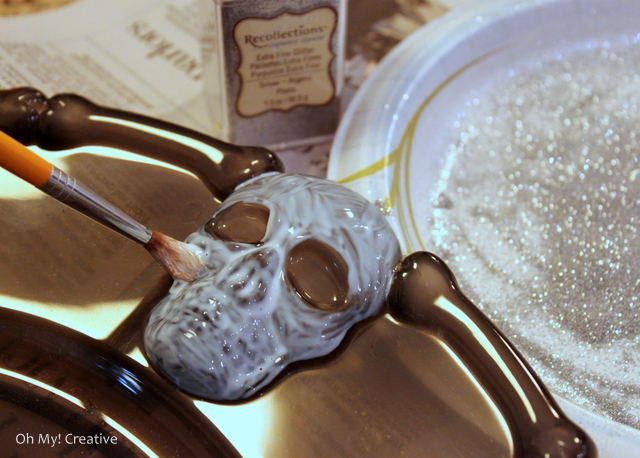 Over a paper plate, sprinkled the glitter generously on the painted skull and let them sit until dry. Once dry, take a clean, dry paint brush and gently brushed off any extra glitter. Place a rhinestone in each eye. So easy! Here are a few other details from my tablescape. Love using small pictures frames as placecards! This one is perfect with the rhinestone rim and glitter spider! I reused my Glam Skull Candle Holders, from a past Halloween, along with a piece of sparkly fabric as a tablecloth. I found these glittery foam spiderwebs at Joann Fabrics and thought they would be perfect to lay over my beaded coasters. 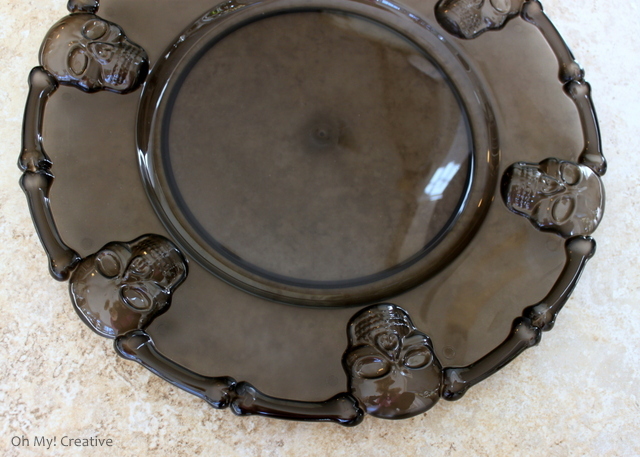 These skull rings were perfect to add to the stemware! I would love you to come link up at my Craft, Create & Inspire linky party .. This is brilliant! Great way to really dress up the plates! Beautiful table. I hope you will stop by and link this up to my Wickedly Creative Halloween Ideas Party if you haven’t already. So cute and stylish…and spooky as Halloween should be! Great job! Thanks Kathy for stopping by my blog! I love DIY Halloween projects! Oh, my…I love this! I just turned the pumpkin version of this platter into a wreath for my front door and I now wish I would have done the glitter step to mine! I am going to remember this idea for future use! Great idea! LOVE the platter!!! And all the decorations are AWESOME! Thanks for hosting the party every week! Love the chargers! I haven’t seen them here. Thanks Kathleen! Unfortunately, not all the store get in the same merchandise. Hi Ava! I was a little nervous about the glitter near the food as well, but I served the food on dinner plates and it actually cover a good amount of the glitter skulls up. The food would not have really come in contact with the glitter. I did take one charger and cover the glitter with Mod Podge…this worked well at sealing the glitter although it made it a little dull. I did do a test of the glitter under the plates and it did not show through. Looks like we think alike! Thank you for linking up at last weeks craft, create and inspire linky! Your project is featured this week, hope you can join us ! Love this glammed up charger! Every year I have to resist to not buy a ridiculous amount of these plates! I think next year I’ll be making these. Lots of great and affordable ideas. We are going out for Halloween but you’ve got me thinking about next year. Halloween is a great excuse for inviting friends over even without costumes! Fun to decorate! Thanks, Stephanie! I love the rhinestones against the creepy black spider! Great ideas! Everything looks fabulous! I think someone loves Halloween! I love all the decorations you have made lately! Yes, Halloween is my favorite holiday! I usually have a party or friends over so I can decorate or make fun drinks! It’s fun! This is such an inspirational post. I would love it if you could share it at our WIW link party to day. I hope you can join us!